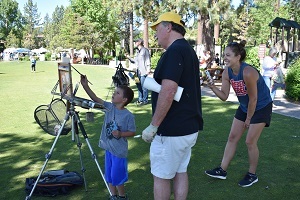 North Tahoe Arts is excited to once again host the North Lake Tahoe Plein Air Open in 2019! 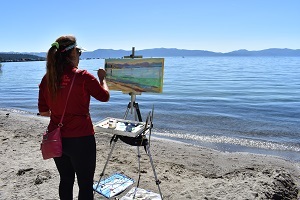 Accepted artists can look forward to five days of creating “en plein air” in the stunning Lake Tahoe Basin. Event activities include plein air painting demonstrations, hosted paintouts with refreshments and an event-long Plein Air gallery exhibit and reception featuring participating artists’ past work. Cash prizes will be awarded to the top selected works in the Main Competition and the Quick Draw Competition. All entries must be submitted electronically with a non-refundable fee of $35. Please submit three to five high-resolution (300 dpi) JPEG images of original works that have been created within the last two years. All submitted works must be original and have been completed en plein air. Submitted work must be reflective of medium and style that the artist will portray during the event. No digitally manipulated images are allowed. Artists must be age 18 or older to participate. A selection committee will review submissions and select up to 30 artists to participate in the event. The previous year’s Best of Show award winner will be invited back without jury process. Notification of selected artists will be sent to each applicant no later than April 9, 2019. Upon acceptance, a participation fee of $95 is due to North Tahoe Arts no later than April 23, 2019. Artist agreement forms will be emailed to accepted artists following the announcement. Artist understands and agrees that all works displayed or presented for sale to the public shall be original paintings created by the artist in the North Lake Tahoe or Truckee area during the time of June 25-29, 2019. Artists are required to paint within the set boundaries throughout the duration of the event. Maps will be provided to demarcate the boundary area. A minimum of 3 paintings created during the event is required for the Public Exhibition and Sale on Saturday June 29. Canvases will be stamped at registration on June 25th. Only canvases with the proper stamp will be allowed for sale and competition. All works for sale must be properly framed and ready to hang. Artist presence is requested during the gallery/event reception on Friday, June 28 and during the Awards Ceremony/Public Exhibition and Sale on Saturday, June 29. 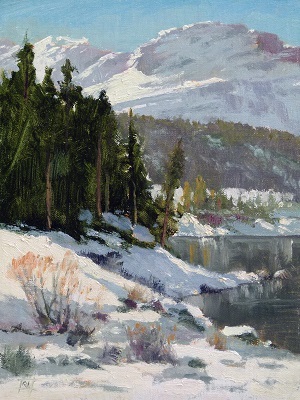 The North Lake Tahoe Plein Air Open supports North Tahoe Arts, a 501(c)(3) non-profit organization. 40% of all sales (gallery or public sale) will go to North Tahoe Arts. A cashier will be present during gallery hours and the Public Exhibition to facilitate all artwork sales. For the duration of the Plein Air event, Corison Gallery at North Tahoe Arts will hold a plein air exhibition featuring works by participating artists. Artists are invited to bring one previously completed original work to hang for sale. Artwork must be properly framed and wired for hanging. Artwork must have been created en plein air within the last 12 months. Unsold artwork must be collected by 7pm on June 29th. Artists are responsible for their own lodging, transportation and meals. A list of discounts through area hotels will be provided to artists upon acceptance. 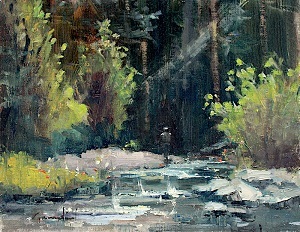 We are thrilled to have the following jurors at the North Lake Tahoe Plein Air Open! Lindenberg- Richard is an award winning landscape painter, based out of Northern California. After 30 years as a landscape photographer, Richard took a class in soft pastels to enhance his Polaroid transfers, and has since dedicated himself to the possibilities that painting presents. 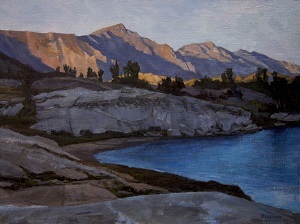 He is a committed plein air painter and has studied with many of California's professionals. 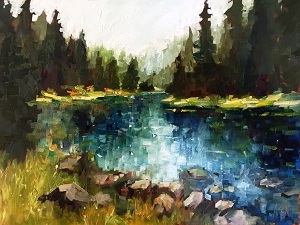 Andy Skaff- Although Andy's easel can usually be found in the mountains and coastal regions of Northern California, his early days were spent in the French countryside studying with celebrated plein air painter Kevin McPherson. Andy has been honored with multiple solo shows and his work is widely collected. With a clear eye and bold strokes of the brush, Andy endows his remarkable paintings with all the vivid color, contrast and splendor of the Western landscape and it's urban treasures. Michele de Braganca- Michele was first introduced to plein air painting while in Italy in the mid-80's. She moved to Lake Tahoe to be near the mountains she loves, and goes on regular pack trips to immerse herself in the unspoiled backcountry to paint. Over the years, Michele's work has been exhibited in numerous regional and national shows, for which she has won awards, and has been published in Plein Air magazine. Philippe Gandiol- Philippe is an award winning painter, born and raised in France and later transplanted to Northern California, who has been painting in oils for over 25 years. He works as much as possible from life, believing that only in life can he find the full range of light and color he wants in his paintings. Philippe is an active member of the California artist community and offers private instruction as well as workshops.